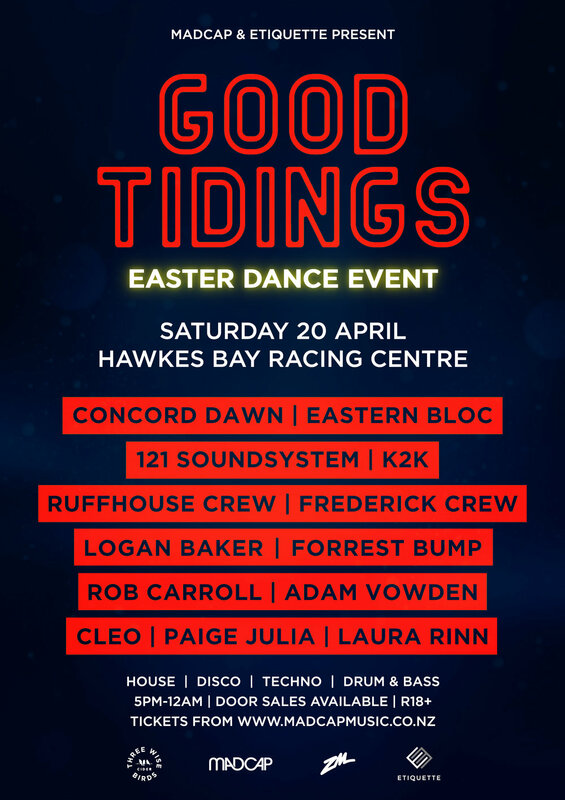 Madcap and Etiquette have come together for the first time to present Good Tidings - Easter Dance Event. Hawke's Bay Racing Centre will play host to the inaugural multi zone dance party on the Saturday of Easter weekend held inside the Hylton Smith Stand. The event will be split across two stages to showcase a range of New Zealand’s best, as well as up and coming electronica DJ's, ranging across house, techno through to drum & bass and everything in between. Good Tidings opens the door to tasteful dance music, played in a unique venue, which overlooks the stunning surrounds of Hawke's Bay. We expect our guests to be open towards others, regardless of their origin, gender, sexual orientation, religion and age. We reserve the right to remove visitors who do not abide by these rules and show aggressive, homophobic, transphobic, sexist, racist or ableist behaviour. Sexual harassment is not tolerated. If you experience or witness any form of harassment, please report it to our staff on duty.